A Gloucester County man with Alzheimer’s is part of a highly-experimental procedure called Deep Brain Stimulation. Also used with Parkinson’s patients, researchers are testing whether the therapy helps cognition and memory for those with Alzheimer’s. 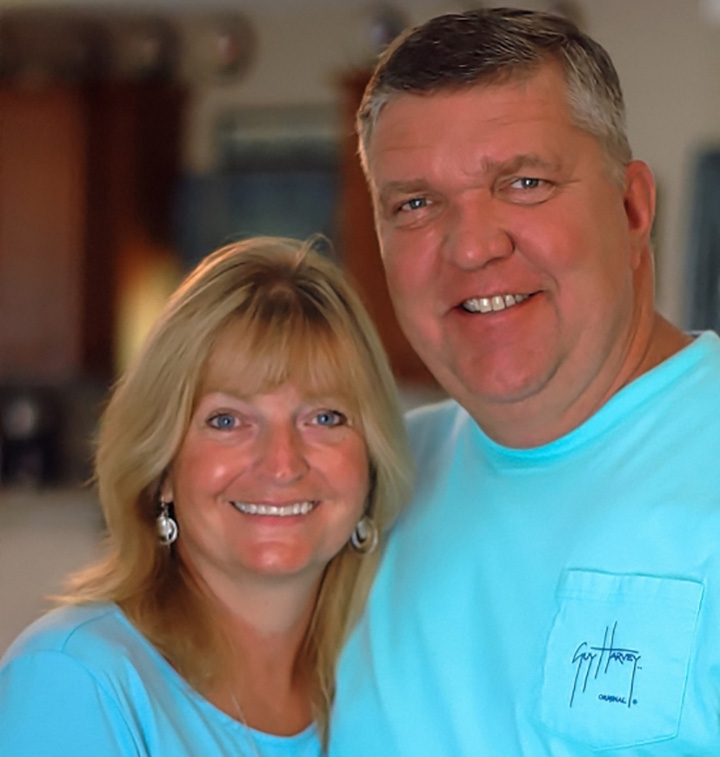 Don Talbott was playing in a gospel band, when his wife Christy noticed something wrong. Christy Talbott: He would sort of space out. He would stop playing in the middle of a song, he would stop singing if it was a singing part for him. Don Talbott: I remember messing up, getting confused. I remember feeling tired. He was just 39 years old and it got worse. Don Talbott: I used to ride a motorcycle every day to work and I would get lost. Christy Talbott: He had come home to me one day and said a weird thing happened to him, he was at a stoplight on the motorcycle and couldn’t remember what to do. Well, he forgot to put his feet down! Don was beginning his journey with Alzheimer’s, earlier than most. Dr. Constantine Lyketsos: There is no cure. Dr. Constantine Lyketsos at Johns Hopkins Memory and Alzheimer’s Treatment Center. Dr. Constantine Lyketsos: The current idea is that the major cause is the deposition of a certain protein in the brain called amyloid protein, which triggers a series of other brain changes leading to death of nerve cells in key brain areas. Those protein fragments slowly destroy the hippocampus, where memories are first formed and spread to other regions of the brain, killing cells and brain functions until at the last they destroy the part of the brain that regulates breathing and the heart. Christy Talbott: We were told maybe five to seven years in the beginning, and we were at year four. Don Talbott: …and it’s not like you just go along and then one day you die. That process is very painful. Conventional medication helped the symptoms, but did not stop the progression. Christy Talbott: At this point, Don was having a very difficult time in finding his words. He was having terrible amounts of anxiety, behavioral issues. Then, he heard about a highly-experimental deep brain stimulation program at Johns Hopkins and became one of 42 people to volunteer for a surgically implanted pacemaker-like device, deep in brain. Dr. Constantine Lyketsos: Very careful imaging is done to locate the part of the brain where we want the electrodes to end up, then the holes are drilled in their brain. Don Talbott: I’m awake and I hear them starting to drill holes in my head and I hear crunch, crunch, crunch, crunch, crunch…. Dr. Lyketsos: … after the holes are drilled, then one at a time, these teeny little electrical wires are slowly pushed into and guided to where we want the tip of them to end up. Don Talbott: If you can imagine, these leads go from the very top of my head down to about level with my eyes. Dr. Constantine Lyketsos: And then the second part is the ends of the wires that are outside of the skull are fed under the skin of the head and down the neck into a small pocket right below the shoulder, as is with a heart pacemaker. Recent failures in Alzheimer’s trials using drugs to reduce the buildup of beta amyloid plaques in the brain, have sharpened the need for alternative strategies. Here, researchers are trying to enhance the function of the brain, mechanically and this point don’t know exactly how it works or if it works. Charles Fishburne: What did Deep Brain Stimulation promise? Christy Talbott: Absolutely nothing, because they don’t know. Don Talbott: It’s almost like walking into a room that’s poorly lit. That’s kind of the world that I live in. You tend to move a little slower, ‘cause you don’t want to trip over something. Don Talbott: It was like the lights came on and I was just wide awake. But then after, four or five weeks, that started to fade. But something had dramatically changed. Christy Talbott: Two weeks after surgery, they have to go in and test all the leads. He was remembering people that used to live on a street when he was a little kid, he could tell you their names. This is a man who couldn’t remember my name at the time. Dr. Constantine Lyketsos: What happens next is we try to sort out the question of dose and age and then if we feel strongly enough that there is a likelihood that this will help, then we try to fund a larger project. Don is a volunteer, a guinea pig and a victim of a disease for which there is still no cure. Charles Fishburne: Has it changed the progression of the disease that most people experience? Don Talbott: No. I do believe it has extended my ability to communicate. The only reason that I am able to stand here and speak to you, is this device. Without this device, I probably couldn’t put a sentence together. I might not even be here. Christy, plan to spend what time they have left, to share his story and a message of hope. Christy Talbott: We feel very fortunate. Don is 10 years into this disease and that’s a miracle. The fact that he is 51 years old, ten years into this disease, and he is still with us, is a miracle.